"Now it seems honeybees may have a way of helping to keep their workforce healthy - by employing bees that feed "medicinal honey" to other members of the hive." "A group of worker bees called "nurse bees", if they are infected with a parasite, selectively eat honey that has a high antibiotic activity, according to Silvio Erler of the Martin Luther University Halle-Wittenberg in Halle, Germany and his colleagues." "These bees are also responsible for feeding honey to the larvae and distributing it to other members of the colony. So it's possible they are the hive's doctors, prescribing different types of honey to other bees depending on their infection. If that is true, it could be a big part of how bees fight disease." (Source BBC) "Honey Bees Play Doctors and Nurses"
Early in 2014, my wife and I watched a documentary on the global issue of colony collapse disorder on just how and why Bees are so important to Agriculture all around the globe. There were a couple of interesting points mentioned, aside from the usual controversy of GMOs and Chemical Insecticides. One important clue was revealed in the California's Central Valley agricultural areas whose orchards are extremely dependent on the services of Bee Keepers. These Bee Keepers move their hives around to provide pollinating services to various Almond, Peach, Cherry and other orchard Farmers. The fact is that these bees being used in this way are over worked and under stress. They also are being forced to pollinate and feed on a monoculture diet with little else in the way of additional dietary supplements in the form of natural dietary variety which comes from a community of plant life. Hence they have to artificially provide these Commercial Bees with synthetic anti-biotics which would be present in a normal healthy diet involving great variety of pollen food choices such as countless wildflowers for which they have zero access under a sterile industrial Ag environment. Above right you can see one example of something which is mixed with water and laid out close to the hive for the honeybees to access. Of course, bees are not the only self medicating creatures. You can bookmark this video and watch it from the link below here later which came from the Animal Planet program about the importance of biodiversity of grasslands for herbivores who also find a treasure trove of pharmaceuticals in such pristine habitats called "Most Extreme Animal Medics - Using Plants To Self-Medicate". This is actually one of Joel Salatin's of Polyface Farm's talking points with what he calls "Salad Bar Beef"
AMHERST, Mass. – "Researchers studying the interaction between plants, pollinators and parasites report that in recent experiments, bees infected with a common intestinal parasite had reduced parasite levels in their guts after seven days if the bees also consumed natural toxins present in plant nectar." For me, much of these debates about origins is a waste of time and counter productive to finding real world solutions NOW on how humans need to better manage the Earth. But I guess we're kidding ourselves now aren't we. That's not how these various ideological-religious factions work is it ? This obsession with control of worldview is further and further disuniting this planet, and frankly, NEITHER SIDE seems to care. What fascinates me is that quite often it is the developing world farmers who are more open to such Biomimicry or working with Nature, than their industrial farming counterparts in the rich nations. Industrial Nation Farmers are shackled ideologically and psychologically to what the Industrial Ag corporations and the governmental advisors are feeding them. Add to that all those US Farm Subsidy entitlement programs for which ONLY conventional farmers are entitled to and not organic, they have exacerbated the problem of educating and weaning Industrial Farmers off the welfare state programs. In the mean time, the Earth's health continues to downgrade because basically the ongoing degradation of the natural world is actually financed by the very Officials in positions of responsibility and care. Something radical has got to happen soon or the damage will be irreversible. Does everyone get this ? Or is obsession with worldview still more important ? Somehow I have a spooky feeling it's still the later. Several interesting paragraphs in their article were relevant as to why Farmers should be changing their agricultural practices to a more holistic approach away from the monopolized chemical practices encouraged by industrial corporations with a vested interest in keeping the status quo. This article's interview dealt more with the head researcher of the study, Leif Richardson, who is credited with the two photos, above and at the right here. He actually explains a bit further, deeper and specifically on the importance of this research as far as practical application on the Farm. “The results suggest that growing plants high in these compounds around farm fields could create a natural ‘medicine cabinet’ that improves survival of diseased bees and pollination of crops,” Dartmouth College in New Hampshire said in a statement. He also hits on something else extremely important and that is just where the problem with Colony Collapse Disorder is found to be the worst around the globe. While many documentaries on CCD have mentioned it being a global problem, it is at it's worst in North Americas, Europe, China and Australia. Why ? Doesn't take a genius to figure out who leads the way through profiteering in the conventional industrial agriculture business model and which corporations within those Nations stand to gain big time with the status quo and wish to monopolize the world's food supply. Further experiments will show whether the compounds also benefit honeybees, which have been hit in North America and Europe by a phenomenon called colony collapse disorder, said Leif Richardson, who headed the study. Parasites have been fingered, but insecticides and intensive monoculture, which destroys the bees’ habitat, have also been cited as possible causes." In any event, the developing world farmers do not reside in wealthy nations with generous welfare entitlements. They are also closer to the land than most industrial nation farmers. Even still, count on a major fight by giant Ag corporations who have some of the largest war chest bank accounts to get what they want and with the blessing of the governments which back them. For people with a clue, this should be a wake up call as to who and what you are putting your faith and trust into. I love this article. Do I hear "Let's promote Monoculture" anyone ??? Bees need a great healthy variety in their diet, not some limited genetically modified junk foods. Look at what junk food has done to human beings. This is why a great variety of beneficial pollen producing plants [shrubs, perennials, etc] need to be planted around the fringes and margins of farms and their fields. This is why agricultural fields need to be smaller with chaparral and other shrub barrier mounds as safe food and home habitat havens for beneficial pollinator/predatory insects. "Bumblebees infected with a common intestinal parasite are drawn to flowers whose nectar and pollen have a medicinal effect, a Dartmouth-led study shows. 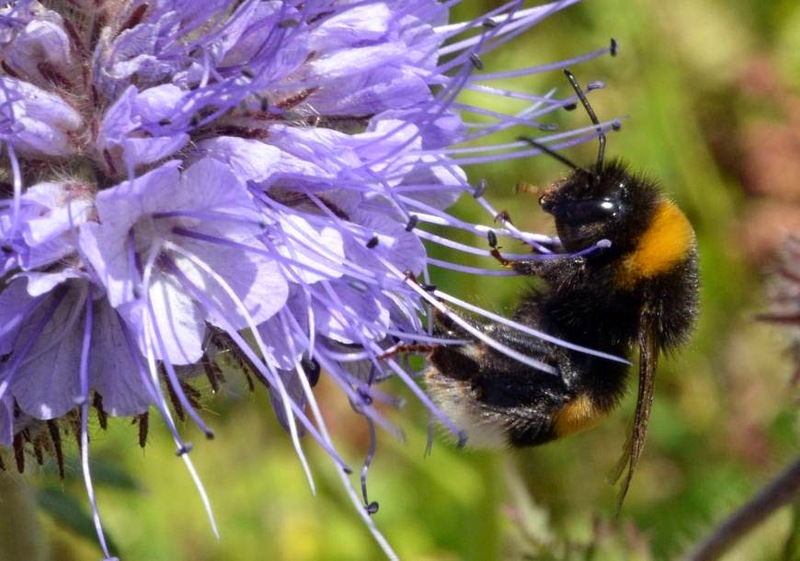 The findings suggest that plant chemistry could help combat the decline of bee species." "The researchers studied the effects of a group of plant secondary metabolites found naturally in floral nectar -- iridoid glycosides -- on bumblebee foraging and plant reproduction. Iridoid glycosides can deter deer and other herbivores, but the researchers' earlier studies showed the compounds have a medicinal effect on parasitized bees by reducing their parasite load." 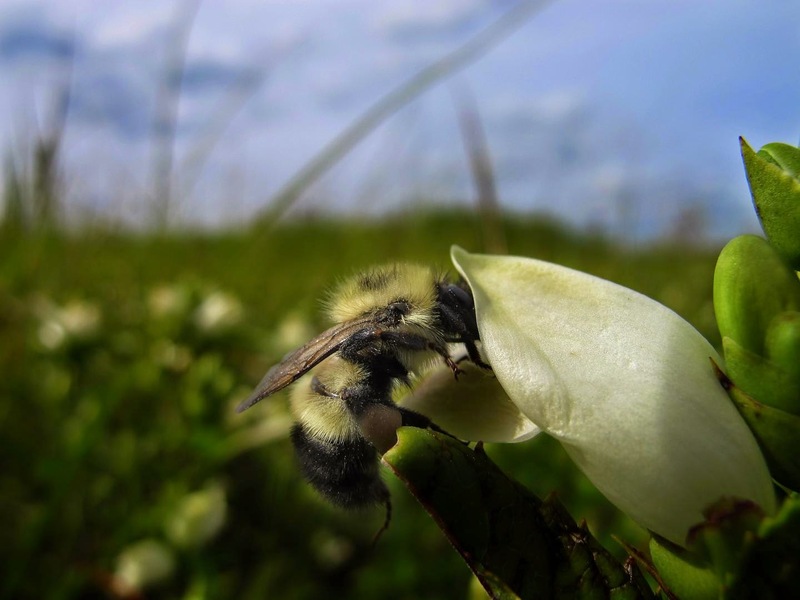 "In the new study, the researchers looked at concentrations of two iridoid glycoside compounds, aucubin and catalpol, in nectar and pollen in four populations of turtlehead, a bee-pollinated wetland plant found throughout eastern North America. They then manipulated concentrations of the chemicals in those flowers to study their effects on bee foraging." One really fascinating thing was that the parasites also seem to have a beneficial effect on making the bees pollinate these specialized iridoid glycoside concentrated nectar flowers more and that these flowers responded by donating more of their pollen to other flowers which brought about higher reproductive success rates of their own. So are the parasites evil ? 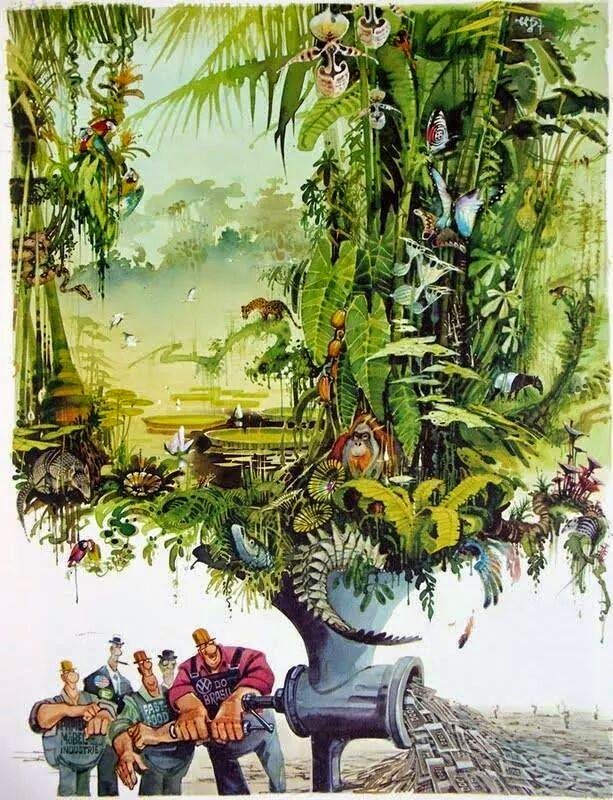 Clearly humans are going to have to rethink their view of the complex mechanisms found in Nature and how disrupting the balance of Nature is what creates problems. Accepting blame and personal responsibility is not a natural imperfect human thing to do. However, such responsible admissions are going to be necessary if people are going to learn from their mistakes and make the needed corrections to put the natural world right. Allowing giant corporate business entities carte blanche to do whatever they wish to increase their precious corporate bottom lines is no longer going to cut it anymore. "The results showed that relative to healthy bees, those infected with the intestinal parasite greatly preferred visiting flowers with the highest iridoid glycoside concentrations. Bees attacked by a second antagonist, a parasitoid fly, did not respond in this way to nectar chemistry. The researchers also found that flowers with the highest concentrations of nectar iridoid glycosides donated significantly more pollen to other flowers following bee visits, showing that nectar chemistry can affect plant reproductive success. Now switching some gears here and moving over towards a different direction away from Honey Bees for the moment. Most conversation when it comes to the subject of pollination is always about the European Honey Bee and after that of course follows Bumble Bees. Nothing wrong with that of course, but rarely are all the other more important Pollinators like various flies, mosquitos, wasps, etc, etc ever focused upon and they should be. One of my goals this past summer's visit to California was to drive back up to my former long time residence in Anza and photograph a plant which I always found important to my property's landscape ecosystem and Garden's environment. 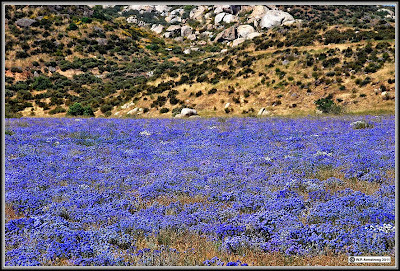 It's a plant that most folks in and around Riverside County probably don't really pay much attention to unless they actually see it growing en masse in some field which is highlighted by the richness of the cobalt blue flowers when they bloom. The plant is called Woolly Stars (Eriastrum densifolium). Perhaps a better known variety is Santa Ana River Woolly Stars because it has had some controversy surrounding it's protection from developers between the cities of San Bernardino and Riverside. While the flowers are strikingly spectacular, the foliage is somewhat dull grey and sparse in appearance and probably that way most of the year except for those two hottest summer months of the year when it is in full bloom. Try looking up info on this plant and you won't find very much other than the usual out of touch intellectual descriptive dry data which serves mostly to document the plant's existence. And that is really a shame because there is so much more to this plant other than a handful of dry dull stats only a Botanist could love. For residents of Anza and Terwilliger Valleys, this plant to the right here in the photo next to a friend's horse corral is one you have often seen, but perhaps ignored other than when in full bloom and never gave it any credit of worth beyond that short showy display of blue flowers in the summertime. It's only a foot or more tall shrub which has beautiful flowering blooms for those two hottest months, but as far as landscape value, not nearly as impressive as perhaps other larger chaparral ornamental species. But believe it or not, it's also an important wildlife magnet for not only pollinators, but also beneficial insect predators. When I lived up in Anza and opened up some spaces in my wild landscape within my property's acreage, this little shrub spread. It loved the openness, the direct sunlight and decomposed granite sandy soils. This is probably why it is more often found naturally in washes and especially floodplains like bajadas or alluvial fans in and around Riverside county. This one in the photo at right was taken at a friend's place in Terwilliger on Yucca Road. 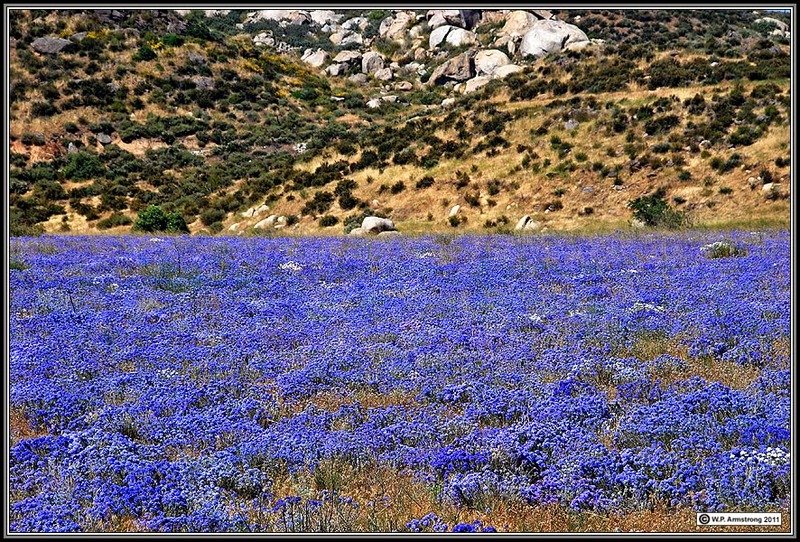 In fact what was surprising to me was the mass display of these blue flowers in the open fields east of this shot. I say surprising because this particular area has been very hard hit by the past three year's drought which has effected all of California. And yet still, it was found together in large groups in full bloom this past June/July when I was there for visit. Below is the picture of the field at the end of bloom which surely others in Anza have also seen but never thought much about the plant. Now it's not overly spectacular at this point, but still impressive given the drought extremes. Now take another look at a photo below here taken back during a wetter rainy season in 2011 along the Hwy 243 from Beaumont to Idyllwild where a far more brilliant display was recorded and posted on Palomar's Wayne's Word Botany pages. Notice the potential ? 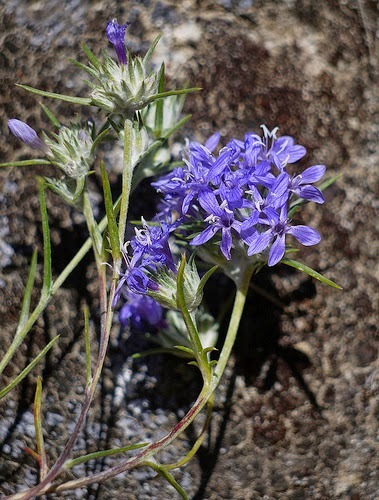 I'll post the link below it as other beautiful pics of other flowers along Hwy 243 are posted for folks enjoyment. You might also take special note of the Chaparral in the background behind this field which also shows a deeper green healthy colour, probably the last time this region experience a good soaking rainy season. Of course the main reason for my bringing up the subject of this plant was certainly not for it's Horticultural value in the landscape. I highly doubt anyone would put up with the dry dull grey rangy looking foliage which is common most of the year. But once again for me it was it's incredible ability as a beneficial insect magnet for my wildscape and garden in Anza. On very hot days when these plants were in full bloom, the first thing you first hear is the intense high pitched humming of what turned out to be hundreds of Hover Flies and Bee Flies. 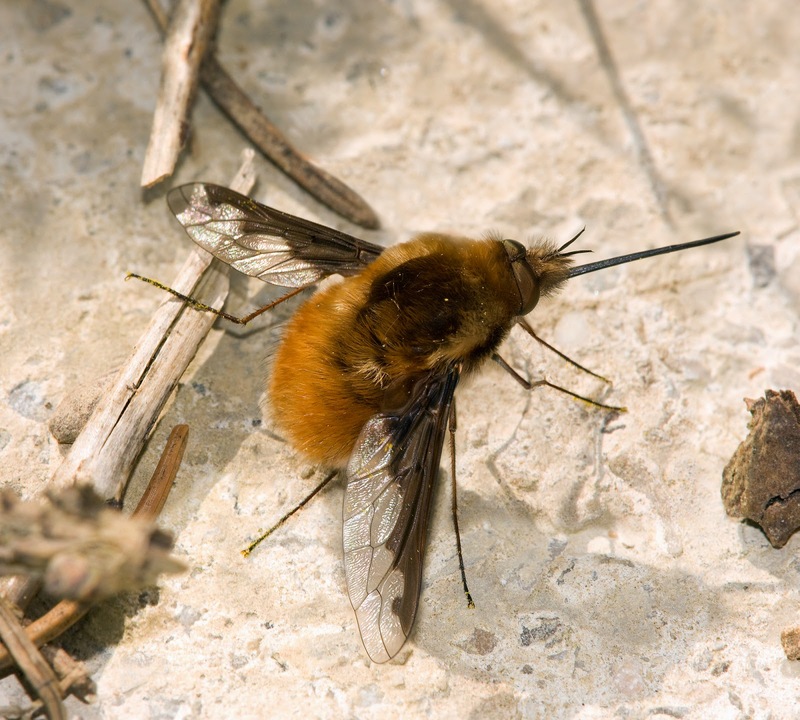 I first noticed Bee Flies on my property back in 1985 when I planted a Mediterranean type plant from Asia called Blue Mist (caryopteris x clandonensis) which was given to me by a friend. These mini-helicopters do their amazing and incredible acrobatic tricks with regards their flight. Aside from the high pitch of their humming, it was these entertaining maneuvers that captured my attention. I could sit for the longest time watching these Bee Flies moving from Woolly Star flower bundle to another Woolly Star. The info on these flies is that they also thrive in hot dry sandy or gravely locations, which would account for their abundance throughout the Anza area. The other interesting similar types of pollinating critters which visit this Woolly Star shrub are the Hover Flies as seen here in the photo collage below left here. 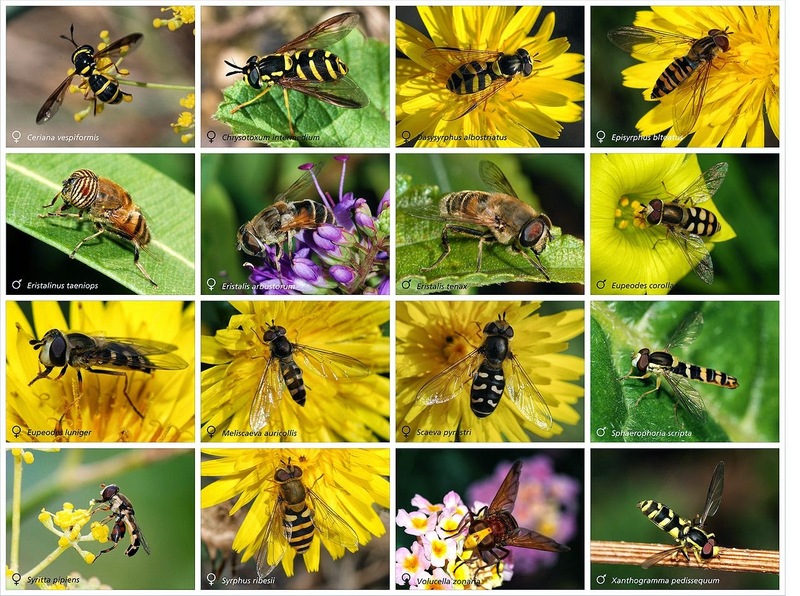 When you research both groups of Bee Flies & Hover Flies, the info on them reveals that there are many 1000s of species or varieties and that there are most likely many more 1000s yet to be discovered and identified. The other interesting service these critters provide aside from their incredible importance to pollinating numerous plants worldwide, is when they are in their youth where they are described in larval stages as predators or parasitoids of the eggs and larvae of other insects. Hence both Fly groups are beneficial as biological controls for your gardens, landscapes and if respected enough, could well have extremely positive benefits on a larger scale farming operations if Farmers were open-minded enough to break away from the Industrial Ag sector and attempt going more the organic farming route. In the Wiki entry on the Hover Flies, there is a nice summary on what some people are doing with certain species of Hover Fly. "Unlike adults, the maggots of hoverflies feed on a variety of foods; some are saprotrophs, eating decaying plant or animal matter, while others are insectivores, eating aphids, thrips, and other plant-sucking insects. This is beneficial to gardens, as aphids destroy crops, and hoverfly maggots are often used in biological control. Certain species, such as Lampetia equestris or Eumerus tuberculatus, are responsible for pollination." "Many species of hoverfly larvae prey upon pest insects, including aphids and the leafhoppers, which spread some diseases such as curly top. Therefore, they are seen in biocontrol as a natural means of reducing the levels of pests. Gardeners, therefore, will sometimes use companion plants to attract hoverflies. Those reputed to do so include alyssum, Iberis umbellata, statice, buckwheat, chamomile, parsley, and yarrow." Many folks will recognize many of the flowering companion plants listed in the above description for attracting garden predators for biological control agents in the garden. However, there are countless varieties of natives in any ecosystem area around the globe which will work equally well as a beneficial insect magnet. All a person has to do is some personal research and if that fails, then take personal responsibility and start observing things for yourself. For example, this picture to the right is of a native California Coffeeberry. 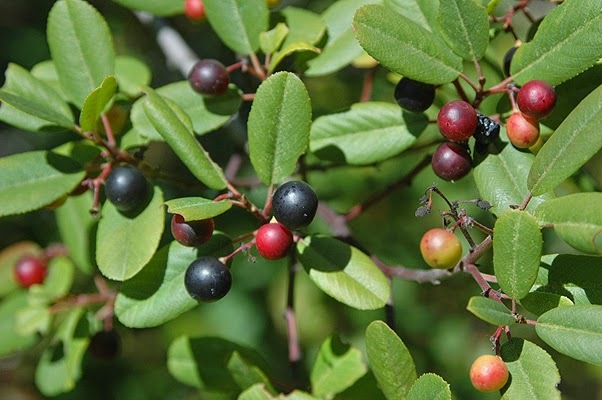 The beautiful bright evergreen foliage and multi-coloured berries are the reasons people choose them from their Native plant nurseries for the landscape. But I guarantee you, positively nobody ever intends on planting them for their flowers. So why is that ? Well, take a close look at the photo to the left. Dull ? Mundane ? Drab olive green ? Yes of course, according to the flawed viewpoint of some Governmental land managers, they are probably just too dull and mundane to be bothered with by the average gardener. Yes, all those words could be used to describe the average person's taste in what a garden's flowering plants should like like when in bloom. The photographer of that photo above left, James Soe Nyun, said Coffeeberry flowers are mostly nondescript to most humans. He got that right. I'm different on the other hand. The California Coffeeberry behind my old place in Anza I found to be an amazing magnet for every kind of insect winged creature available. For me it was the presence of all these critters which gives these flowers their beauty. Every type of Fly, Mosquito, Gnat, Bee, Wasp, Beetle, Moth, etc, etc, etc which normally never hang out with each other, were in fact crawling over each other on these blooms to get a taste of what ever invisible pheromones this plant with inconspicuous flower clusters was giving off. But especially those tiny little predatory wasps which prey after the bad garden insects. They were most abundant. There were Bumble Bees hovering above all this insect party chaos, but they were too intimidated to come down and take their chance at a sip of the brew. As far as I've known, I'm the only one who has written about this until now. The photographer I mentioned above where I found that picture also had a description of why he took it and the words of a unhappy camper of a gardener who described the exact same phenomena I did, but with a rather negative slant. "The coffeeberry’s flowers are much more nondescript to humans. 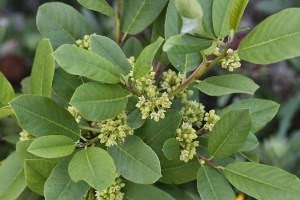 On the recent garden tour I spoke to a homeowner who was wishing that she hadn’t planted her coffeeberries so close to paths because the bugs seem to go crazy over its blooms, more so than just about any other native plant. Here we have the humble blooms of Frangula (Rhamnus) californica ‘Eve Case.’ "
While I totally and adamantly disagree with that lady Gardener's take on the California Coffeeberry flowering phenomena, I am also at the very same time overjoyed by the fact someone else describes exactly what I have been saying all along about the native California Coffeeberry chaparral plant for landscape use. In fact she said it draws "bugs" insects more than any other California native plant. Yup, sure enough, that's what I've been saying all along. Nice to be verified, even if in a rather unusual sort of way. The ultimate goal for any Gardener, Landscaper or commercial Farmer should be to attract those very critters such as the tiny parasitoid wasp in the above right photo which scouts out your garden and preys upon the very things you don't want taking up residence there. Like the numerous caterpillars which chew up all manner of leaves and fruits from your vegetable garden or fruit orchard. This is the exact thing people pass over when out and about in Nature looking to photograph some magnificent scene for which to publish on a Google Plus or Facebook page. What a waste. Not that I don't enjot pretty scenery, I do, but if you do actually see such unusual phenomena happening, don't discount it, document it and send it to those who study these things for purposes of Biomimicry or Biomimetics. In the descriptive pages I referenced regarding hoverflies and beeflies, the experts admit they don't know what exact role most of those critters play within most ecosystems. No kidding, it would be a challenge. They are just so tiny and elusive. 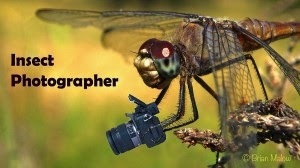 Go beyond getting that perfect shot of a common honeybee pollinating a flower. Document other things like the mass display of insects on a shrub like California Coffeeberry. It is also imperative you know the time of year differing plants bloom and what they attract, especially if you are laying out strategic plans for organically maintained landscape. I can really only speak from my own experience in Southern California in the chaparral backcountry. The Coffeeberry for example is one of the earliest bloomers and with what looks to be this year's heavier than normal rainfall in California, this would be a golden opportunity to document this chaparral shrub which attracts more beneficial "bugs" insects than any other California Native. Other Natives like California Holly (Toyon) is an early summer bloomer and Redshank or Ribbonwood are late Summer bloomers. Keep in mind also, the same shrub or other flowering plant will bloom at different times depending on elevation. I have observed both of these shrubs having similar beneficial insect attracting abilities. Find out as much as you can in and around whatever environment you live in and plan accordingly your garden and landscape which will allow you to pursue a course of a more organic nature. But you first need to deprogram yourself and break away from all those glittering labeled chemical goodies you see at those commercial Garden Center or Home Improvement stores. Forget their illustrations and the easy to use instructions. Realize that when you use that industrial junk to kill the supposedly bad insects, you also kill the good ones, even if you don't see any of them. When I first worked as a representative and field tester for many of the products put out by one of my former employer, Coors-Biotech, back in the late 1980s, there was so much promise about even the idea behind Biotechnology. The idea was of course that these people and their companies were going to learn from Nature and replicate what nature does for solutions to our problems. How was I to ever know that most of today's corporate industrial biotechs actually view nature as flawed and poorly designed ? That Human scientific genius would one day view themselves above nature and take it upon themselves to correct what they view as Nature's flaws and poor designs. And as a result our natural world in general would go so far down hill that many other experts would be saying life on Earth is on the brink of extinction ? 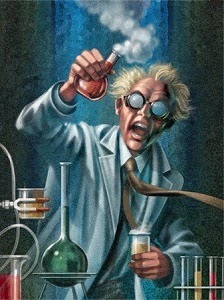 This is why the average person's view of a Biotech Scientist is more that of a mad scientist. Not that they are truly insane, but the results of much of what they have done have hurt rather than help the natural world. Biotechs were supposed to practice what we call biomimicry or biomimetics which is ultimately copying what Nature does and hw it functions. Not this obsession of obscene profiteering through patent lawsuit filing thugs we have today. 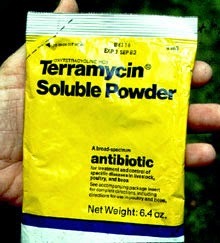 That was never what biotechnology was supposed to be about. But nevertheless, we are assured Science will just find a way, except when it doesn't. 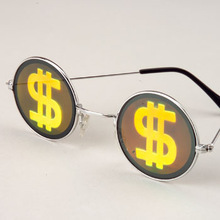 The Corporate and Governmental entities are going to pursue whatever their heart's desire for wealth and power. It should be acknowledge that the planet will suffer no matter what. Others will have religious and ideological motives for defending these entities. Aside from some Divine or other extraterrestrial intervention, it seems highly unlikely that humans will find real solutions for saving this planet. Seriously people, look at the daily News Reports as to what is going down all across the globe. Does it look like true peace and security is just on the horizon or around the corner ? Now, you'd think that the experts would be interested in safer organic approach solutions inspired through Biomimicry, but the problem is, these things I've mentioned above have zero profit value for most corporate Entities and their share holders. If they cannot patent it and monopolize an industry, they are not interested in an organic natural approach to custodianship of our planet Earth. For those with families who do care and want their children to have a deeper appreciation of our natural world, then understand it starts with proper parenting to educate your own children. Don't expect the public school system to do that job for you. Thus far they've failed because what is taught is only the textbook solution provided by an industrial mandate. In the mean time, there are some folks who have come up with some tools to help parents teach their children more about the Outdoors which seems to be foreign to most people living in the Industrial Nations today. Take a look at this documentary below when you find the time. PART I - "Attracting Wild Bees & Wasps to Landscapes & Farms is the best Insurance Policy"
PART II - "How to construct the best Insurance Policy for your Agricultural Business Venture"
Michigan State University Extension: "Attracting Beneficial Insects with Native Flowering Plants"